CES 2018: SAMSUNG Exynos 9 Series 9810 processor announced. 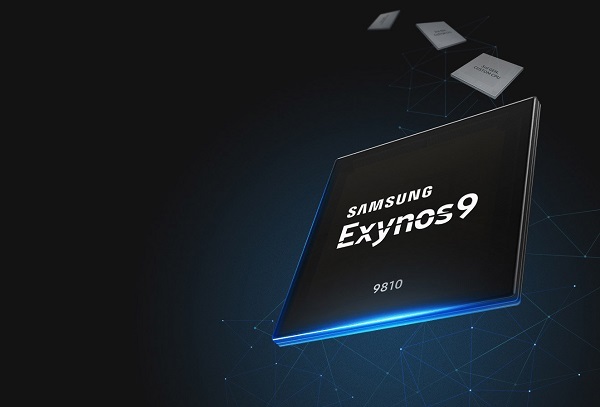 Samsung Electronics today announced the launch of its latest premium application processor (AP), the Exynos 9 Series 9810. The Exynos 9810, built on Samsung's second-generation 10-nanometer (nm) FinFET process, brings the next level of performance to smartphones and smart devices with its powerful third-generation custom CPU, faster gigabit LTE modem and sophisticated image processing with deep learning-based software. With the benefits of the industry's most advanced 10nm process technology, the Exynos 9810 will enable seamless multi-tasking with faster loading and transition times between the latest mobile apps. The processor has a brand new eight-core CPU under its hood, four of which are powerful third-generation custom cores that can reach 2.9 gigahertz (GHz), with the other four optimized for efficiency. With an architecture that widens the pipeline and improves cache memory, single-core performance is enhanced two-fold and multi-core performance is increased by around 40 percent compared to its predecessor. Exynos 9810 introduces sophisticated features to enhance user experiences with neural network-based deep learning and stronger security on the most advanced mobile devices. This cutting-edge technology allows the processor to accurately recognize people or items in photos for fast image searching or categorization, or through depth sensing, scan a user's face in 3D for hybrid face detection. By utilizing both hardware and software, hybrid face detection enables realistic face-tracking filters as well as stronger security when unlocking a device with one's face. For added security, the processor has a separate security processing unit to safeguard vital personal data such as facial, iris and fingerprint information. The LTE modem in the Exynos 9810 makes it much easier to broadcast or stream videos at up to UHD resolution, or in even newer visual formats such as 360-degree video. Following the successful launch of the industry's first 1.0 gigabits per second (Gbps) LTE modem last year, Samsung again leads the industry with the first 1.2Gbps LTE modem embedded in Exynos 9810. It's also the industry's first Cat.18 LTE modem to support up to 6x carrier aggregation (CA) for 1.2Gbps downlink and 200 megabits per second (Mbps) uplink. To maximize the transfer rate, the modem supports a 4×4 MIMO (Multiple-Input, Multiple-Output) and 256-QAM (Quadrature Amplitude Modulation) scheme, and utilizes enhanced Licensed-Assisted Access (eLAA) technology. Not only will multimedia experiences on mobile devices with Exynos 9810 be faster, but they will also be more immersive, thanks to a dedicated image processing and upgraded multi-format codec (MFC). With faster and more energy-efficient image and visual processing, users will see advanced stabilization for images and video of up to UHD resolution, real-time out-of-focus photography in high resolution and brighter pictures in low light with reduced noise and motion blur. The upgraded MFC supports video recording and playback at up to UHD resolution at 120 frames per second (fps). With 10-bit HEVC (high efficiency video coding) and VP9 support, the MFC can render 1,024 different tones for each primary color (red, green and blue). This translates to a vast 1.07 billion possibilities of colors, or 64 times the previous 8-bit color format's 16.7 million. With a much wider color range and more accurate color fidelity, users will be able to create and enjoy highly immersive content. In recognition of its innovation and technological advancements, Samsung's Exynos 9 Series 9810 has been selected as a CES 2018 Innovation Awards HONOREE in the Embedded Technologies product category and will be displayed at the event, which runs January 9-12, 2018, in Las Vegas, USA. The Exynos 9 Series 9810 is currently in mass production.